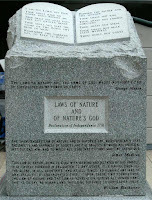 We here in Alabama are experts on the Ten Commandments, aren’t we? Now, I know I’ve only lived here about ten months. But there’s just something in the air. The statue of the Ten Commandments may have been removed from the judicial building in Montgomery, but it stood long enough to make Alabama the holiest state in the Bible Belt. That is, until Arkansas put up their own statue of the Ten Commandments. The jury’s still out on who’s less sinful. This whole thing got its start in Kentucky, you know. Back when I was in college, the Kentucky legislature passed a bill requiring all public school classrooms to have the Ten Commandments posted in them. But since a private donor paid for the plaques, it couldn’t possibly be ruled unconstitutional. Which, of course, it was. But for the year or two that those plaques were in those classrooms, misbehavior must’ve been at an all-time low. Too bad it all happened right after I was graduated from high school. Actually, statues of the Ten Commandments at the courthouse or a plaque of the Ten Commandments in a classroom probably don’t improve anyone’s behavior. They’re symbolic at best, and idolatrous at worst. God’s words on Sinai were active, creating something new in Israel. They weren’t the final word, but began a dialog that continues to this day—a dialog between God and humanity, and a conversation among humans—about what they mean, what change they require, and how they shape community. I say it’s a dialog, because none of the Ten Commandments are as straightforward as they sound. For example, what does it mean to have no other gods before God in a time and place where the old Egyptian and Babylonian and Greek and Roman and Norse gods are no longer worshiped, but money and career and possessions and relationships have taken their place? Or does the commandment not to lie require that we be honest, even if telling the truth hurts someone’s feelings unnecessarily? And we all know the age-old debate about whether or not it’s a sin to steal a loaf of bread if your children are starving. Thousands of books can be written about each of the commandments and what they really mean. Jesus himself added to the debate in the Sermon on the Mount by reïnterpreting them. “You’ve heard it said of old, but I’m telling you something new.” He made it clear that the act of adultery doesn’t begin with an act, but with thoughts that make an object of another human being. And murder doesn’t begin when we pick up a weapon and point it at another person. It begins long before that, when we start thinking negative thoughts about that person. And murder is something that’s on our minds this week, isn’t it? 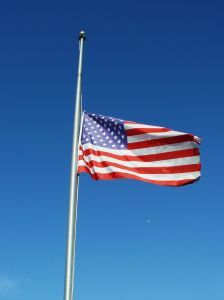 We have a flag out in front of our church building, and it’s flying at half-mast. This is in response to a mass murder in Las Vegas a week ago today. It was the worst in our nation’s history—one person had enough weaponry and enough ammunition to kill or wound well over 500 people. I hope you joined me in sending your thoughts and prayers. We’re all pros at thinking and praying by now. We have all probably memorized our thoughts and prayers, we need to think them and pray them so often: Columbine, Virginia Tech, Sandy Hook, Orlando, Charleston, San Bernardino, Las Vegas… those are just a few of the bigger ones, but in reality the list goes on and on. The fact of the matter is that (as of this past Monday) in the past 1735 days—that’s less than five years—there have been 1516 mass shootings in the United States, resulting in over 1700 deaths and over 6500 injuries. This statistic doesn’t include any crimes in which fewer than four persons were struck by bullets. This means that in the average week in this country, only one day out of seven is free of mass shootings. Six out of seven days… Okay, so maybe the Ten Commandment statues are working, since apparently the average mass shooter is observing a day of rest. In other areas of our common life, when a crime or action or practice is known to be a danger, we take action to try to protect people. No texting and driving. No liquids on an airplane. Wear your seatbelts. Don’t speed. Inspect restaurants for unsanitary conditions. All of these things are required. They may be inconvenient at times, but we all benefit from them. III. It’s a Door Prize, Not a Raffle! So what’s the response been to six mass shootings a week over the past five years? On the federal level, the only response has been to remove regulations on the purchase of guns. Remember that the next time you have to go through airport security in your stocking feet because one person once tried to ignite his shoes on an airplane. Actually, I have to come clean. I just broke the ninth commandment. That little paragraph wasn’t written in response to America’s gun violence problem. It was written almost 500 years ago by John Calvin. It’s the way he opened his discussion of the sixth commandment. And that’s interesting in and of itself. When he discussed each of the Ten Commandments in turn, he opened with their most literal, generally accepted interpretations before delving more deeply into them with more nuanced arguments. This means that the first thing on his mind when he thought about the words Thou shalt not kill was that we’re all responsible for one another’s safety, and that we should not only refrain from killing, but that we should do whatever we can to protect one another. It can be—indeed it often has been—argued that one way of doing this very thing is to put guns into everyone’s hands so that we can protect each other in the event of a mass shooting. This has not only been argued, but it’s been tried, and it’s being tried. It is the general philosophy of our lawmakers. But it’s obvious that this philosophy isn’t working. More guns in the hands of our citizenry seems to be resulting only in more mass shootings and more innocent victims being killed or wounded. If experience tells us that more guns results in more deaths, then we’re clearly in violation of the sixth commandment by not demanding that more be done to prevent this epidemic. Conclusion: Thoughts & Prayers & Teddy Bears? So how can we help? More thoughts and prayers? Surely, if we only think enough and pray enough, lives will be saved, right? Clearly not. Our thoughts have been exposed as thoughtless and our prayers ineffective. The parents of Sandy Hook were not comforted by the kind thoughts we sent their way, and it appears that God has thus far chosen not to respond to prayers that aren’t accompanied by action. 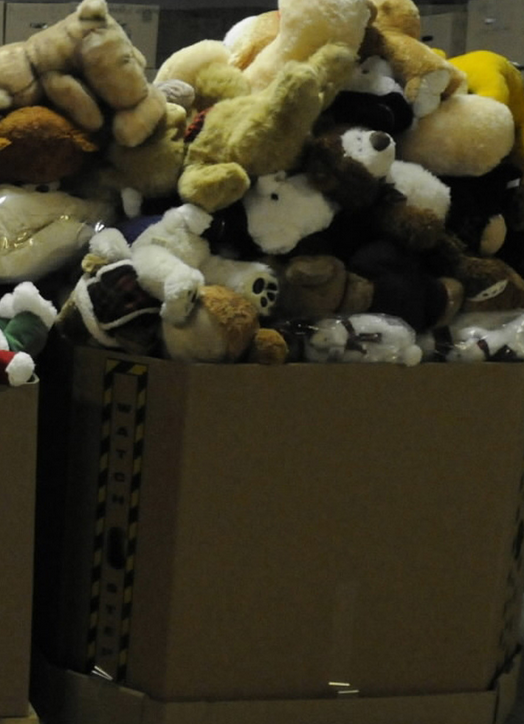 Teddy bear memorials appear to be no more effective than thoughts and prayers. In the future, the only prayer I plan to allow myself in response to mass murder is the prayer that the culture of fear and violence that reigns in my country can be overcome with a resolve to follow the clear example of both Jesus and the rest of the world. And though I don’t wish to impinge on anyone else’s freedom, I will refuse to vote for anyone running for office who sends the families of victims their own thoughts and prayers, but who wants money from the gun lobby more than they want an end to violence. If we want to better understand how prayer works, the example of Jesus tells us that we don’t fold our hands, talk to God, and then go about our merry way. Jesus prayed in the wilderness, and then healed the sick. He prayed on the mountain, and then cast out demons. He prayed by the lakeshore, then fed the five thousand. He prayed in the garden, and then died for our redemption. We’re asked to think and pray for the victims of gun violence, but we think and pray… and then do nothing. And we vote for leaders who do less than nothing. The deadline is far behind us. It’s time to do something. And if all we can do is write letters and vote, then that is, at least, more than most of us have been doing. Because the whole human race has been bound together by God in a kind of unity, we know that the safety of all has been entrusted to each. We’re reminded every day that more weaponry isn’t the answer. It’s time to try something else. 1,516 mass shootings in 1,735 days: America's gun crisis—in one chart, The Guardian, 2 October 2017. See https://www.theguardian.com/us-news/ng-interactive/2017/oct/02/america-mass-shootings-gun-violence. See Jacob Paulson, Concealed Carry in Churches, concealedcarry.com (14 September 2016) https://www.concealedcarry.com/law/concealed-carry-in-churches. Josh Sanburn, Giving Away Guns for God, Time (4 March 2014). It should be noted that this story had to be corrected because it was originally reported that guns were being raffled off in Baptist churches. Since raffles are a form of gambling and are thus sinful, they wanted it made clear that the guns were given instead as door prizes. 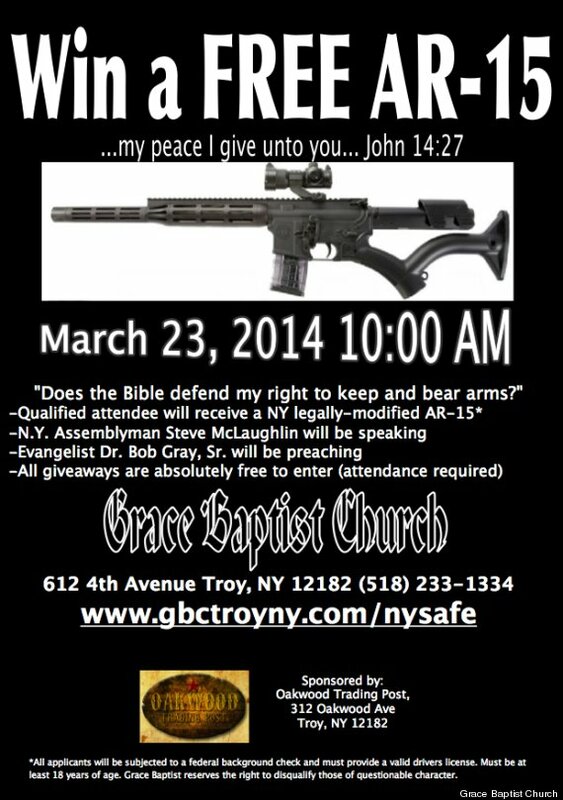 See http://time.com/15748/gun-giveaways-at-kentucky-churches. Jean Calvin, Institution de la Religion Chrétienne, 2.8.39, trans. SG.